For an order of over 200 shirts (a realistic guess at the number needed) the T-shirt suppliers have now said they would need the order confirming by the 22nd of April to be confident of printing & supplying the T-shirts for Friday 3rd May. The t-shirts will be as shown, bright green rather than white. 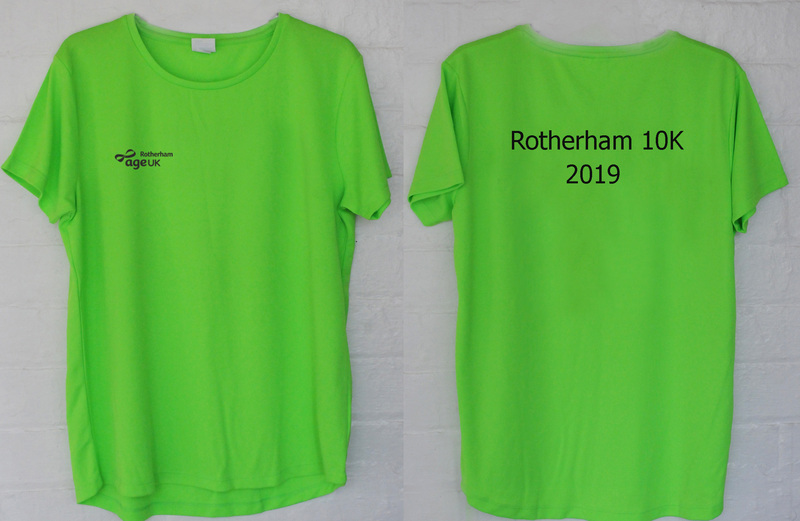 We retain the "Age UK" logo on the front, and have Rotherham 10K on the back. 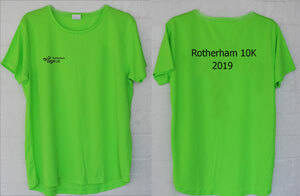 The inaugural Rotherham 10k took place in 2018 and had around 800 entries for the town-centre course. Generously sponsored by Pawson Transport of Braithwell, the event was a huge success on a blazing hot May day. 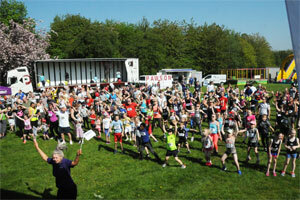 The race charity, Age UK Rotherham, benefited by just over £2400 as a result. The 2019 event again aims to support Age UK Rotherham should a surplus occur. It does not currently have a major sponsor, but is able to proceed thanks to the success of 2018. The promoters and organisers are the running clubs of Rotherham district, namely Rotherham Harriers & AC, Kimberworth Striders and Maltby Running Club. Their time and effort are given for the benefit of the sport, the people of Rotherham and of the wider area. They are joined in the partnership by Rotherham MBC and are again being supported and helped by Pawsons, and by Age UK Rotherham, Rother FM, Rotherham Advertiser, Rotherham Rotary and Sitwell Rotary clubs. Funds received for race entry are directed solely to the stated charity after reserving a cushion of funding for the following year's event. Our aim is to use chip timing for the race, as we did last year. You can see in some images in the gallery that 10k race runners carried an ankle attachment with timer chip. This was no problem (I ran and thought it might be- it wasn't). You can see it in the picture. This year, we will probably be using a system with the responder chip in the bib number (stuck on the back). Either way, use of chip timing makes it undesirable to send out the numbers before (close to) the race day. They are collectable on the day in good time at Clifton Park. Anyone travelling long-distance may of course wish to collect on the day, but if you are local or not far away, you can see the sense of getting the number before the day bearing in mind there will be up to 900 runners. If you ordered a t-shirt, it too will be collectable on the same days.